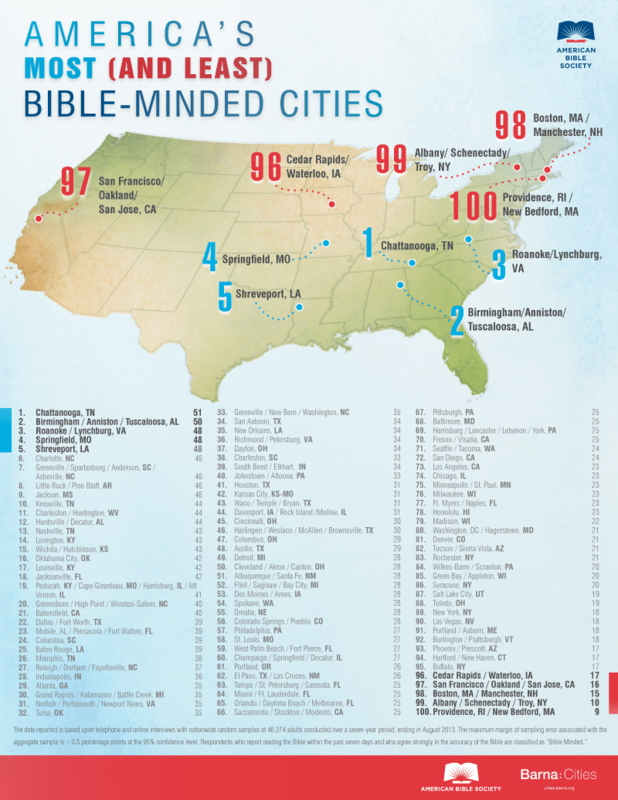 The American Bible Society has put together a list of the most and least “Bible-Minded” cities in the country. Topping the list is Chattanooga, Tennessee. The study also found that the Bible isn’t so well-loved in bigger cities. Only three of the top 25 Bible-loving areas encompassed more than a million households. What about New York, where OMGWTFBIBLE happens? That’s all the way down at 89, only slightly more into the Bible than hedonistic Las Vegas. But you wouldn’t know it from seeing OMGWTFBIBLE live! This entry was posted in News and tagged american bible society, andrew sullivan, bible, new york, news, religion, wtf podcast by omgwtfbible. Bookmark the permalink.